Always make sure you use enough water when cooking your pasta. According to the back of most boxes of pasta a single 3-4oz portion of pasta can squeeze by on 3 quartz of water. But like Alton, I never cook any amount of pasta in less than a gallon of water. A pound of pasta is enough for about 6 adults, if you need more, grab another pot. Speaking of pots, make sure you use a nice large pot with a lid. Since it’s going to hold about 8-14 lbs of water, a light aluminum one is best and pretty reasonably priced at your local restaurant supply store. When storing your pasta make sure it’s in an air tight container away from light and wee little creatures. Start off with HOT tap water and put it over high heat. This is the time you want to add salt and this is not an optional step. It is the only opportunity you’ll get to season the pasta which is a must! 1 Tsp per quart is what I use and also what AB suggests. Put on the lid for quicker boiling. Oil is not necessary in the water because it will just float to the top, instead put a little at the bottom of your serving dish and mix it when the pasta is cooked. Now that water is boiling use tongs and fan out pasta in the water and push the strands down gently. Continue stirring for 30 seconds. Put the lid back on and let it come back to a boil. You can walk away, but stay close and start checking for doneness about 4 minutes later. Never run water over the pasta when it’s finished, and make sure you have a sizable colander so you can shake the water out of it when it’s finished cooking. Do not shake the pasta dry, a little surface water will help hold onto whatever you’re adding to it. 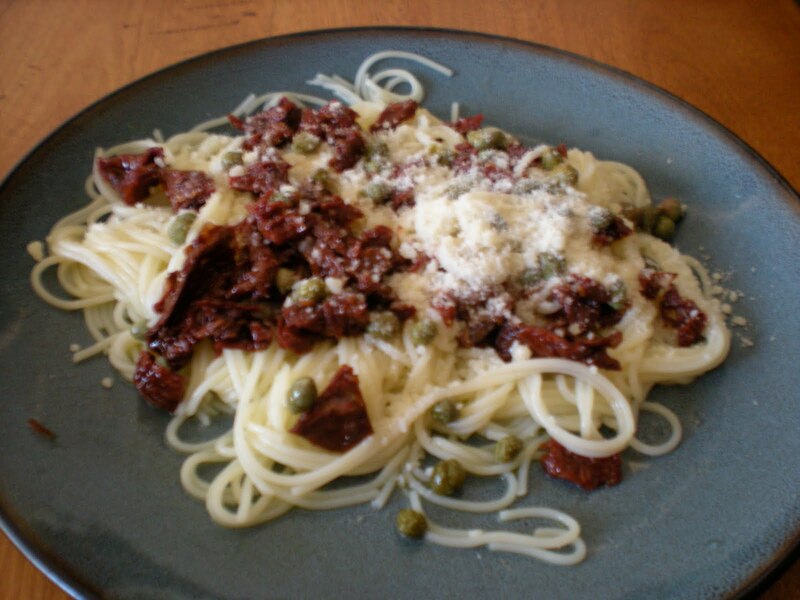 I added a little olive oil to bottom of serving dish, garlic, sun dried tomatoes, capers and pecorrino cheese. You now know the art of cooking pasta, so get out there and come up with some creative ideas of your own. Place water in large lidded pot, add salt and bring to a rolling boil. Add spaghetti, fanning it into the water so that each strand makes contact. Using a wooden spoon or tongs, gently bend noodles to submerge. Cover pot and return to a rolling boil, reducing heat to medium-high. Stir occasionally. Pour 3 tablespoons of good quality extra virgin olive oil into the bottom of a wide serving bowl along with garlic. In 4 minutes, start tasting. When done, a string of spaghetti should be springy when pulled on. To the tooth, there should be some resistance but not so much that the pasta sticks in the teeth. As soon as pasta is done, drain immediately in a large colander (lidded models are the best). Shake pasta to stop cooking but don’t shake dry. And no rinsing!